Eight seniors sign to their future colleges, on National Signing Day, on Wednesday, February 6. 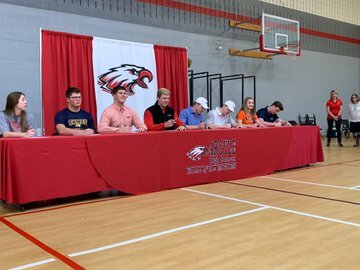 On Wednesday, Feb. 6, 2019, eight of Argyle’s best athletes signed to their desired colleges/universities in order to compete at the college level in football, baseball, volleyball, and beach volleyball. Oklahoma State University will be welcoming offensive lineman Preston Wilson to play football. After OSU took the Liberty Bowl this past season, Wilson hopes to become part of another winning team in the years to come. Offensive lineman Connor Homeyer will join fellow Eagle grad and former quarterback Jon Copeland at Incarnate Word University. Defensive back Blake Ramsey signed to Colorado School of Mines. Ramsey accumulated 83 tackles, one interception, one fumble recovery, and three blocked kicks during his final season. After putting up 14 catches, 168 yards, and three touchdowns in his first and only varsity season, tight end John “JD” Crowder, signed to the University of Tulsa. Interior defensive lineman Brandon Lancaster will attend Texas Wesleyan University. Lancaster recorded 92 tackles, 15 tackles for loss, five passes defended, one caused and one recovered fumble in two years on varsity. After an undefeated season leading to a state championship, Argyle baseball’s Senior Chad Ricker will attend the University of Texas at San Antonio. Rebecca Sutton heads to the midwest to join the Ohio Wesleyan University volleyball program. Sutton hopes to help the team make it to another NCAC Division III Tournament in the 2019 season. Marby Ward reached the State Championship in volleyball. Ward will get out of the gym and compete in beach volleyball at Tusculum University. The Tusculum Pioneers added beach volleyball as their 21st sport earlier this month. We look forward to following these young athletes into their next chapter.